Thanks to Mike’s Aunt B’s granddaughter’s band director, we were able to get free tickets to see The Lion King tonight at the Minskoff Theatre. 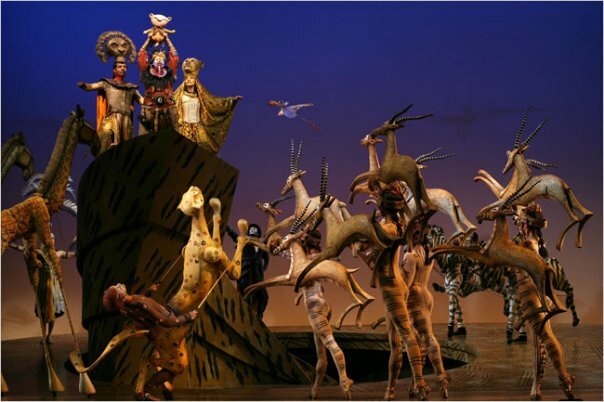 Despite having read very good things about the production, I wouldn’t have chosen The Lion King to be my first ever Broadway show. Still, I’m grateful for the tickets and I’m glad we had the opportunity to go. The Minskoff Theatre is huge, by any standards. We were in the back row of the mezzanine–literally in the last row. It was an impressive vantage point for viewing a show with such extravagant effects. It gave us a good view of the moving floor that helps create so many illusions during the show. From further down in the theatre, it might have seemed even more magical, but I was glad to see how it all worked. The audio, though, was really loud–so loud that there were times I couldn’t understand what was going on. 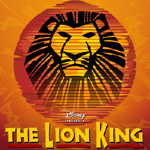 For that reason, I was going to give The Lion King five stars. But then I bumped that up to eight because it was so amazing to watch. But then there was that weird “Can You Feel the Love Tonight” ballet thing, so I took my score back down to six. But then I liked the South African baboon lady so much, I gave the show one more point.